Introducing the JBJ Acella Powerhead. This unit works great with the wavemakers we have in stock. This powerhead is ideal for the dual wavemakers, undergravel filters and can provide excellent circulation for freshwater and saltwater aquariums. Energy efficient, and ul approved. Works great with Wavemakers and Nano Cubes. Great replacement pump for the Nano Cubes. Much less heat produced compared to the original pumps that came with them. 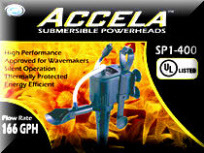 The Accela Pump is ideal for freshwater and saltwater applications. An upgrade pump to the Nano Cube. This unit is UL approved and energy efficient. The Accella Pump by JBJ can also be used with the Duo or Quadro Wavemakers or any wavemaker due to the quality of their shaft.